Explore With Thomas and His Engine Friends in This Collectible 4-DVD Set That Includes A Special Map Of Sodor Thomas Fans Are Sure To Love! Give the Thomas lover in your house this great 4-DVD set for Christmas! They will get hours and hours of Thomas fun! Preschool favorite Thomas the Tank Engine® and his engine friends on the Island of Sodor are celebrating new friends, exciting discoveries and thrilling adventures in an all-new collection, Thomas & Friends®: Let’s Explore With Thomas 4-DVD Set, available on November 6, 2012 from Lionsgate and HIT Entertainment. This is Thomas & Friends first DVD set to include a collectible map of Sodor so that little engineers can track the engines as they travel around the island. 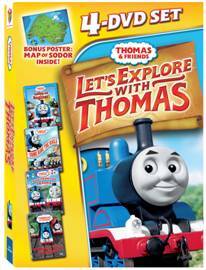 Filled with loads of bonus content, the Thomas & Friends®: Let’s Explore With Thomas 4-DVD Set is available for the suggested retail price of $24.98. Summertime is always beautiful on the Island of Sodor. It is a busy time for all of the engines…but when the Steam engines and Diesels can’t get along, and no work is getting done, the engines are in a terrible mess! Will the new airport be ready in time? Will the bridge get built? Can the engines save the day? Find out in Calling All Engines! · Read-Along, Songs & More! Come ride the rails to fun and adventure with Thomas and the other “Really Useful Engines” as they make tracks to great destinations! Molly is the new engine on Sodor—will she find the perfect job? Gordon learns a lesson in respect and Emily wants to be Queen for a day. Will Thomas and Percy finish their work in time to see a very special bird? Join the fun and excitement in Come Ride the Rails! · 4 Games, Gordon’s Photo Gallery & More! Join Thomas for a birthday picnic, discover a ghost engine that’s not what it seems and learn the legend of a very special lamp with Peter Sam! Then try and keep up with James, listen to Rusty’s beautiful music and make tracks as Thomas tries his best. There’s excitement around every bend in Tales from the Tracks! · 3 Games, Read-Along, Songs & More! Every season on the Island of Sodor brings new opportunities for adventure and discovery. Will Emily get the timber to Farmer McColl in time to save the baby calves? Will Toby muster enough confidence to push Gordon up a hill? Share in these timeless stories, and you’ll see why It’s Great to Be an Engine! · 3 Games, Read-Along & More!